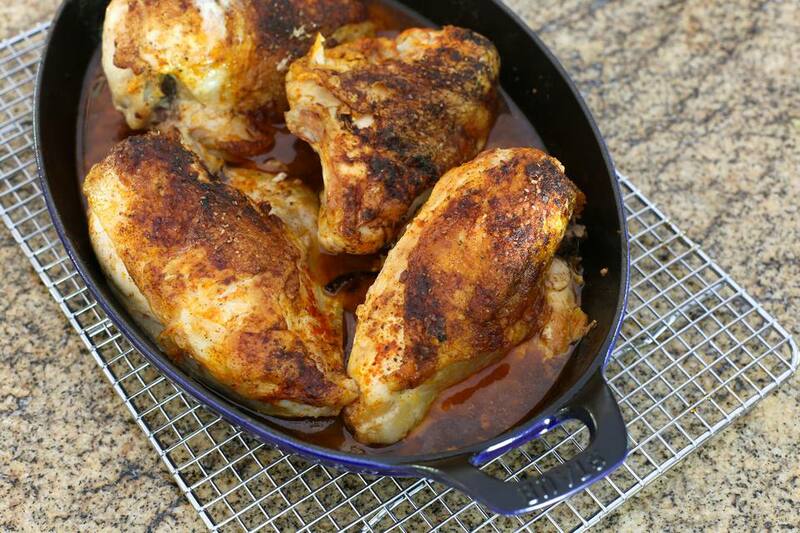 Sweet paprika gives these simple bone-in chicken breasts color and flavor. The chicken is baked to perfection with onions and a little chicken broth. Sour cream is stirred into the drippings to make a flavorful gravy. Serve the chicken with mashed potatoes and a side vegetable or salad. Heat the oven to 400 F (200 C/Gas 6). Lightly oil a large baking dish and set aside. Heat the olive oil in a large skillet or sauté pan. Sprinkle the chicken with kosher salt and freshly ground black pepper. Brown the chicken breasts in the hot olive oil. Put the sliced onions in the prepared baking dish. Arrange the chicken on the onions and sprinkle evenly with the paprika. Pour the chicken broth over the chicken. Bake for 45 to 55 minutes, or until the chicken breasts register at least 165° F on an instant-read thermometer. Remove the chicken from the pan to a plate and keep warm. Skim fat from the juices and strain or put the liquids through a gravy separator. Put the strained juices in a saucepan (or use the baking dish if it is safe for the stovetop). Bring the liquids to a boil over medium-high heat. Reduce the heat to low and simmer for 3 to 4 minutes to reduce and concentrate the flavors. Whisk in the sour cream and flour mixture and heat, whisking constantly, until smooth and thickened. Do not let it boil. Serve the gravy with the chicken.